This is not your average Italian Sausage Artichoke Cheese Pizza, because I actually added a few more ingredients than I listed. I guess you could call it a loaded Italian White Pizza. Needless to say I used the last of the large jar of sun-dried tomatoes that I bought to make that amazing No-Yeast Sun-Dried Tomato Olive Bread and a yummy Pasta dish, Spaghetti with Sun-Dried Tomatoes and Pancetta. I guess it’s time to pick up another jar! 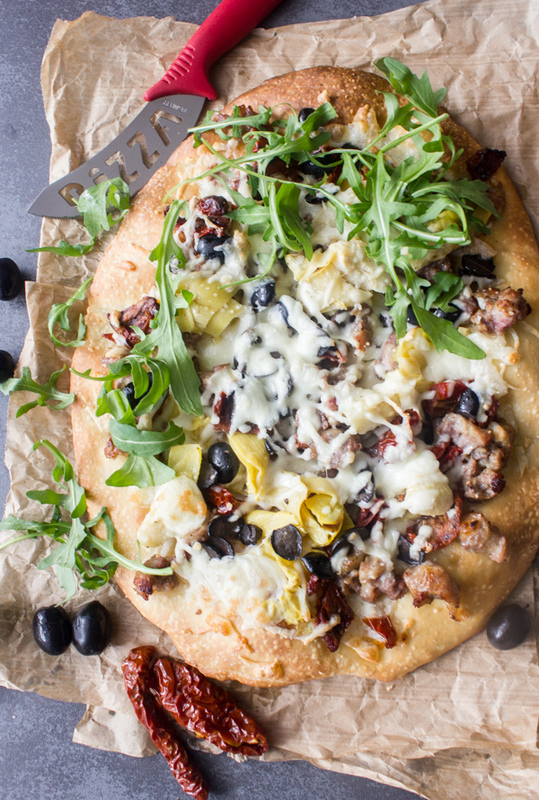 I know a lot of people make Pizza on Friday night or the weekend, but you can bake this Italian Sausage Artichoke Cheese Pizza so quickly with store-bought or bakery bought pizza dough, you will want to make during the week too. 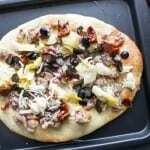 I actually buy pre-made focaccia dough, I find it a little thicker and tastier. 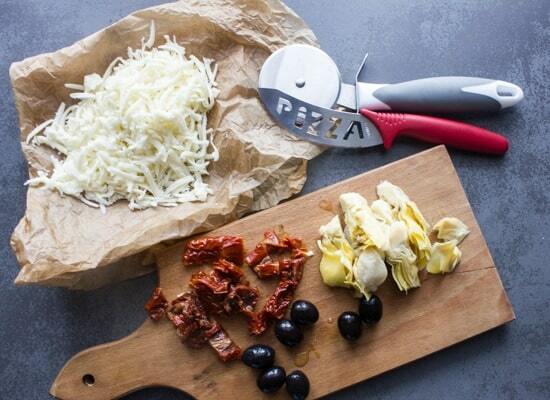 Or you can also make your own Best Pizza Dough when you have time. Nothing like homemade. The first thing I did was bake the crust, since all the ingredients are pre-cooked all you need to do is heat them and melt the cheese. I decided to place some shredded cheese under and on top of the ingredients. I know a lot of Italian food is made with tomatoes, but believe me some of the most delicious Italian food is the under-rated Piatti Bianchi (white dishes), White Sauce Lasagna, Grilled Zucchini Pizza, Cheesy White Sauce Gnocchi just to name a few. 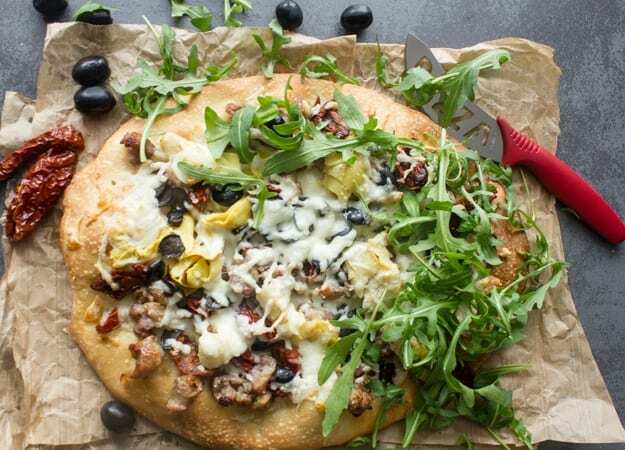 The Italian has decided that this Italian Sausage Artichoke Cheese Pizza is one of his favourites, especially when I added black olives and of course rucola (rocket). It seems rucola is becoming my new “I can’t get enough of this amazing green”. If you haven’t tried it, you must. It gives everything that extra kick. I add a ton of it to my salads also. Buon Appetito! 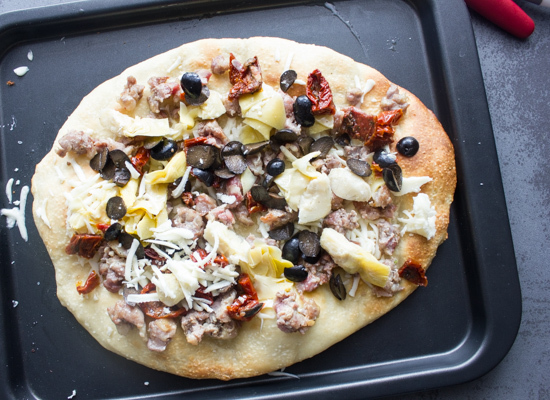 Italian Sausage Artichoke Cheese Pizza, pre-made or homemade dough, fast and easy. 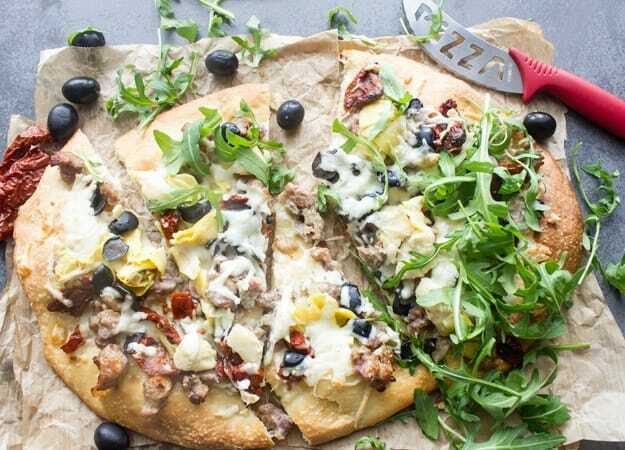 A healthy Italian white pizza recipe. Pre-heat oven to 450° lightly grease pizza pan. 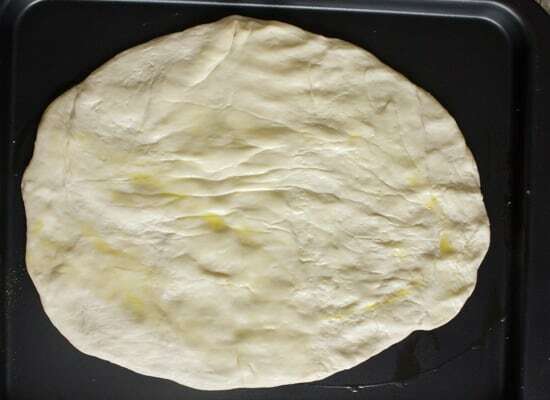 Place pizza or focaccia dough on pan, brush lightly with olive oil. Bake for approximately 10 minutes (or until golden). While Pizza is baking, in a medium saucepan add 1/2 tablespoon olive oil and Italian sausage (remove from casing and chop into small pieces and cook until brown, and drain. 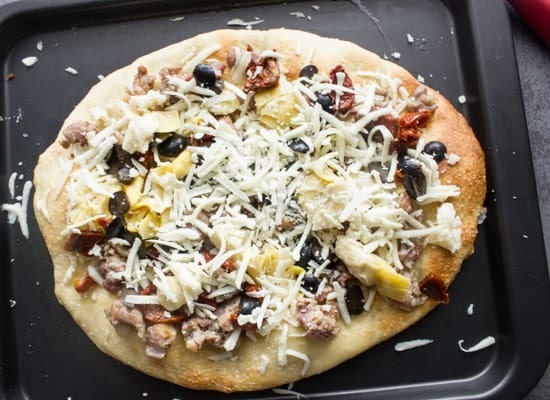 Remove from oven and sprinkle with half the mozzarella cheese, top with drained sausage, sliced artichoke,sun-dried tomatoes, chopped olives, a little sprinkle of basil and oregan and the remaining mozzarella. Bake in oven until cheese has melted approximately 3-5 minutes. Top with shredded rucola (rocket/arugulif desired. Enjoy! Hi Jamie thanks so much, hope you enjoy it! Have a great Sunday! Hi Jess, thank you so much, have a great day. This recipe looks delicious! I recently got a pizza stone for my grill so my daughters and I can make pizza together, so I will have to try your recipe! Thanks for sharing this recipe at Motivation Monday on Mom Home Guide! Hi Lauren, thanks so much, hope you and your daughters enjoy it. Let me know. o-m-g this looks delicious and right up my alley!! Hi Justine, thanks hope you enjoy it! This is my kind of pizza. Looks so yummy. I can’t wait to try your recipe. Pinned for later. Hi Theresa thanks I really like this kind of pizza too! Have a great week. What a beautiful pizza! I’m with you that you don’t have to have tomatoes or tomato sauce to make an amazing Italian meal – and this dinner proves it! 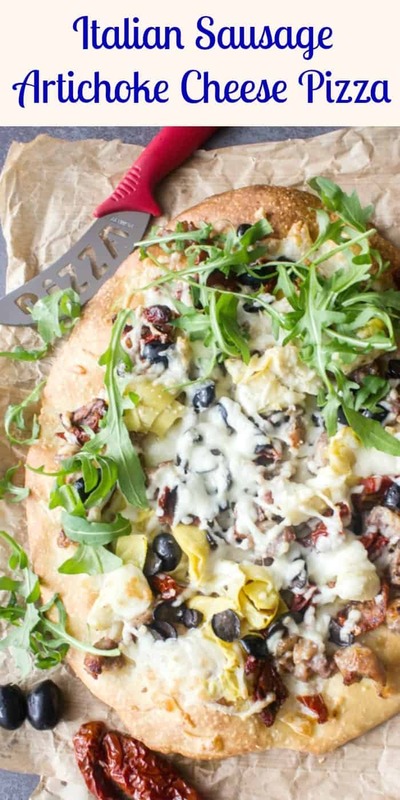 It could be pizza any night with this 🙂 Pinning! Hi Kathryn, thank you and I love non tomato Italian recipes. Yum!! I looks wonderful!! I love arugula and the sun dried tomatoes! My Honey and I are a little strange — our pizza night is Tuesday night and we have a fish meal on Friday — I guess that’s left over when we had to have fish on Friday 🙂 I never have any artichokes to put on pizza — my Honey goes through them so fast there isn’t enough. Your pics are great! !